goin' RV Boondocking: RV Boondocking or... the Evil Motel? RV Boondocking or... the Evil Motel? 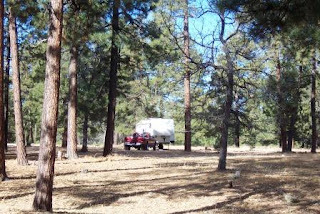 That's our RV Boondocking camp near Heber... up on the Mogollon in Arizona... last year... and a sweet camp it was! :-) Sharlotte wanted to know... so I figured I'd get it over with and admit to the heresy. ... and then... seeing as we're Truckless... as in nada... as in the only thing sitting in the driveway is Lil' Red... who has seen better days... and Slick... (Yamaha V Star) It's a pretty safe bet the Eagle... who hasn't got his RV Renovation completed yet... ain't goin' anywhere for a bit! The store is rentin' us a car... and we're gonna... wait for it! ... stay in... motels... shhhh. don't tell no one! Helps to not be real picky too! Just had to ask-- seriously, invest in a can or two of that spray Ly--l before you go and when you get to each room before going out to the greasy spoon to chow down, spray the s--t out of the comforter, bed linens and pillows, and don't forget the bathroom throne either. All should be dry and sweet smelling before you have to sleep on it at night. Least ways, that is what me and mine do whenever we have to stay in motels (gasp, what an ugly word). Worked real well so far--no bugs that we know of. LOL. Really like the floor in the 5er and the couch. It looks like it is the right size. Did you decide what you are gonna put in the place that usually holds the dining area. Is this where your leather working thingie or your desk from the house is going? Can't wait until you get it all put back together. Have you tested the slide since putting in the strip? Does it work well. We may have to do the same thing under our dining room slide to get rid of the carpet in that one area. Well, sorry for being so long winded, but was excited to see the pics of the finished project. Good luck to you and Heidi, and be careful driving down the road. You gonna be able to post while you are gone or are you gonna disappear for a while?